This post is…well, let’s say it’s a tiny stretch, okay? Here’s the rationale: water + sunlight = rainbow when it’s seen from the correct angle. So I’m picturing rain in here somewhere! LOL! I considered redoing the video to create it in watercolor but, ya know…..it was just so bright and happy, I just went with it! New releases from Ellen Hutson this month are all about rainbows and magic! In the video I show you a couple of the other items (I’ll be using the Mermaid later this month), but I really wanted to make the interactive rainbow card. Sooooo stinking cute! Watch the video below or click HERE to see it in HD on YouTube. This is fantastic! What a great die set and what an awesome card you made!! 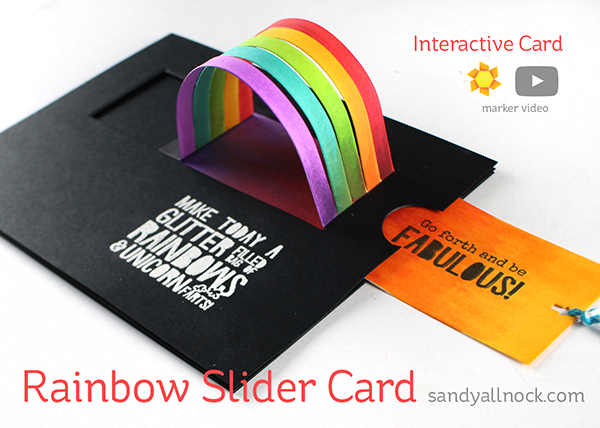 Gorgeous Sandy, I love the rainbow colours wiht the black, it stands more out then with white! Thanks for this beauty! I can’t get over how fun and beautiful this is Sandy!